Ben Rhodes, driver of the No. 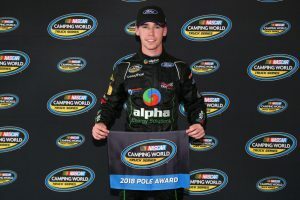 41 Alpha Energy Solutions Ford F-150, earned his third career pole, and second at the “Paperclip,” for Saturday’s Alpha Energy Solutions 250 at Martinsville Speedway. All four ThorSport Racing driver’s will start inside the Top 10 – Matt Crafton (2nd), Grant Enfinger (3rd), and Myatt Snider (9th). This marks ThorSport Racing’s first 1-2-3 start, and the 55th front row start for the Sandusky, Ohio based team.